In February I been a lot into skin care product. I even invested in Clarsonic, there was a lot of hype around it, and I like trying out stuff which are recommended by others. I'm trying to wear foundation for minimum hours just to save my face. I notice that my pores are opening up, when I wear Estee Lauder Double Wear often. Oh, well you can't have everything. In February I also had been obsessed with using up stuff, as well as I been really into cleaning, I feel so much better when everything is clean and organised. As you may notice most of my favourites are from The Body Shop, I'm really liking their range. The Body Shop Dry Deodorant: I'm not a fan of spray deodorant, I prefer them to be dry, so I won't feel them on my skin. I been loving this one from TBS. If you don't know I'm obsessed with Rose scent stuff. It does the job for me, last all day. The Body Shop Organic Cotton Pads: My eyes area is very sensitive, so I have to be careful with what I use. I try many different pads and I think these one are very gentle. They are £2.50 but with my Body Shop Card I pay 15% less. In my opinion they are worth every penny. 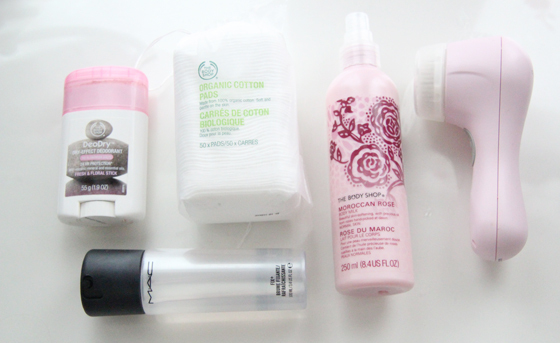 The Body Shop Moroccan Rose Spray Lotion: Again I'm obsessed with Rose scent. I also been loving using spray Lotions on myself, they save you a lot of time. This lotion absorbs to my skin very fast. That's way I like to use it, the smell last on the body for around 6 hours. I used to use the Moroccan Rose body butter (I used up 3 already, so it was time to try something else), I do like it mostly in winter as it's very thick. MAC Fix+ Spray: You can read the full review here. I'm nearly half way through and I must say that I still love it. Clarsonic Mia: I really like it, sometimes it's a bit harsh on my skin, but overall it's really good when you want to give your face deep clean. I love to use it at night, as in the morning there isn't much to remove from my face. It did break me out in the first 2-3 weeks, and I still keep on getting some spots around my forehead (I never break out on my forehead). The skin around my face is very soft now. The full review will come very soon, I still want more time to test it as I only had it for around 6 weeks.